Toronto – OK, so first things first, this 3 song EP is only slightly over 5 minutes long, which means it took me less time to listen to it than to write this review. But it’s awesome. For those who don’t know, Melt Banana is a Japanese noise rock band that has been described (on Wikipedia anyways) as “new wave grindcore.” Their songs are short and fun blasts of high pitched vocals, blasting drums and crazy guitar noises, sounding a bit like what might happen if you teamed up a bunch of hyperactive kids on a sugar rush with a technical metal band and got them to create a soundtrack for the most amazing yet freaky kids cartoon ever. Sadly, that cartoon will only ever exist in my head. ‘Tis the season … for leather? OK, so this is a weird one. 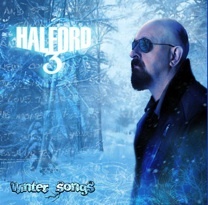 Heavy metal icon and Judas Priest singer Rob Halford has released a Christmas album. I am confused. Aren’t Judas Priest the very same band who back in the 80s were put on trial for allegedly putting hidden satanic messages into their albums so that when played backwards they convinced kids to shoot themselves in the face? Oh, I get it, when you play this backwards, it turns into an anti-Christmas album and …. Dammit! I can’t get this CD to play backwards! I guess I’ll just have to listen to it the regular way. And not shoot myself in the face. Anyways, it seems that other than the chugging guitars and piercing falsetto vocals, this is a straightforward seasonal entry. It’s even got traditional tunes like “O Holy Night” and “We Three Kings,” which actually sounds kind of awesome when given the metal treatment. I wouldn’t mind hearing this played at the mall slipped in between the Bing Crosby tunes. It’s not quite up there with Bing or the Boney M Christmas album, but it’s an interesting change of pace. Every once in awhile, a show comes along and completely blows your mind by the sheer randomness of it. When I saw bauhaus back in 1998 at what was once known as the Warehouse, a muscle-bound freak started random fistfights with everyone around him (women included), a future boyfriend’s watch was smashed in, and management confiscated the camera I had smuggled in. Last night’s Atlas Sound show had a few medical emergencies, a beyond sold-out crowd, and most memorably, my encounter with Bradford Cox. The evening started off innocently enough. The Selmanaires, another Atlantan outfit invited out to support and back Cox in his Broadcast leg, opened up the show right at 10:00. Having known nothing about them prior to their set and contemplating skipping it altogether, they impressed me with their Primal-Scream-esque dancey psychedelia beats. The only thing they have to work on now: vocals and choosing other Georgian bands to cover (hey, the B52’s were great but everyone was sort of puzzled as no one could recognize the tune they chose). Also, this is another up and coming band that has an Asian…and Ricky, I believe he’s of Chinese descent. Tommy Chung sings and provides bass guitar, so there’s another one to add to our list. The real draw for me however (and there is absolutely no surprise here), was their Colombian ultra-babe percussionist Mario Schambon. This guy ripped up those bongos and you could just tell he exuded a genuine joy in being able to percuss onstage, toothily grinning to his bandmates the entire time. 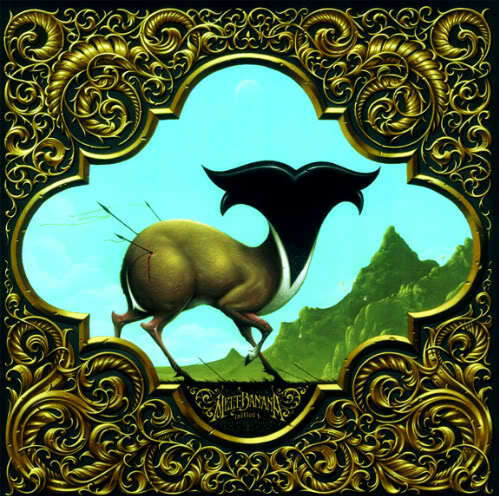 Toronto – Okay, I will admit I tend to pay more attention to UK/Electro/Dance acts then I do to good ole Canadian bands, but once in awhile, I will whip out the poutine, the hockey stick and listen to some good homegrown talent. 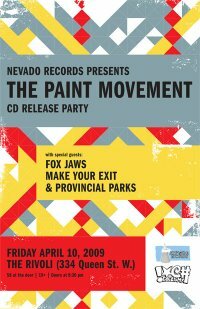 Mississauga’s (don’t hold this against them) The Paint Movement is a BSS / Jazz inspired band that will be having a cd release party on Friday April 10th at Rivoli. They will be playing with three other bands that I have never heard of (Fox Jaws, Make Your Exit, Provincial Parks) but I am sure they are all good ole Canadian bands. Wade or Patricia could probably tell you about them. I’ve listened to the Paint Movement a few times this week and I find their blend of jazzy (re: horns/trumpets) infused soft rock quite comforting as I try to recover from this flu. The Broken Social Scene influence looms large in some of the music, but that is not a bad thing obviously. Anyways, with the kindness of the folks at Nevado Records, you are going to have a chance to check it out for yourself because we are having a contest! Simply email us at panic@panicmanual.com with the subject: “The Paint Movement” and we will set up the winner with a pair of tickets to the show as well as a compact disc.